When it comes to drastically increasing performance in martial art, no one does it better than RMAX. See why and how in this package. 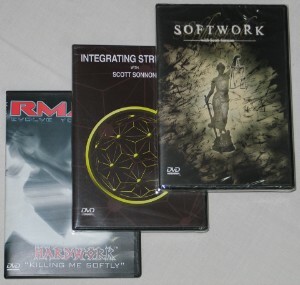 The Hardwork Series has been described as “the most evolutionary approach to martial arts training ever presented on video. Filmed live in Scotland, Coach Sonnon and his team of Head Coaches - Joseph Wilson, Brandon Jones, and Ryan Murdock present the strategic insights, tactical drills and technical secrets that guarantee to skyrocket your performance in ANY martial art system or style. Incremental and sustainable progression is the key to dramatic and ongoing improvement. The Softwork to Hardwork continuum is the key! In the Softwork Series, Coach Sonnon presents this unique training modality. You’ll never look at your training the same way again. Note: No Shipping to the UK: RMAX.tv Productions initially granted distribution rights for the "Hardwork" title to a company in the UK. However, since RMAX no longer maintains a business relationship with this company, RMAX.tv Productions elects not to make any referrals to the said company.